Prime minister Justin Trudeau marches in the Toronto Pride parade last month. The most watched person at this year’s Halifax Pride parade will be a straight white man with a penchant for rainbow socks. 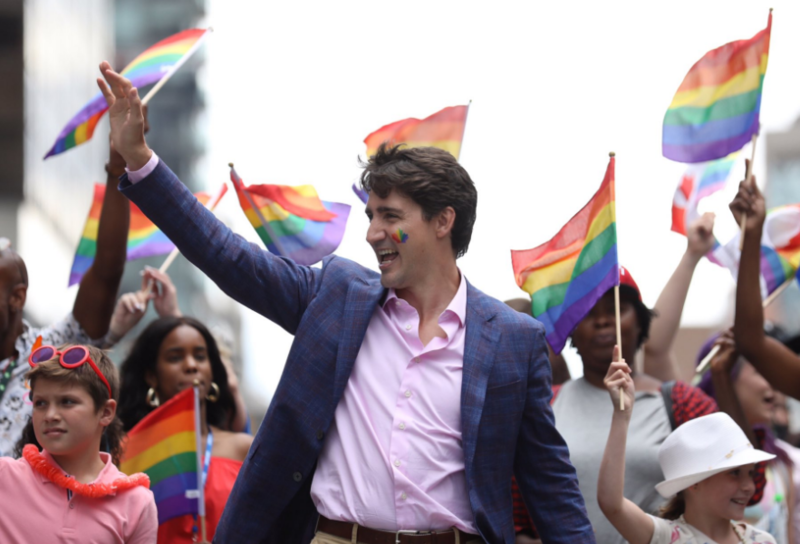 It was announced Monday that Justin Trudeau will be marching this weekend in Halifax, becoming the first sitting prime minister to take part in a local Pride parade. But some members of the LGBTQ+ community say Trudeau’s historic visit isn’t worth celebrating. Kehisha Wilmot, head of the Mount Saint Vincent University Queer Collective, says Halifax Pride is breaking its promise to centre marginalized voices in this year’s festival. Festival executive director Adam Reid tells The Coast there was a “standing invitation” for Trudeau to visit Halifax since last year’s parade, but the organization only found out he’d be coming a couple of days ago. Halifax Pride as an organization is trying to bounce back this year after a disastrous annual general meeting last fall. Members of the Queer Arabs of Halifax and supporters were shouted-down by a gaggle of seemingly straight and cis outsiders who took issue with a proposed resolution to ban any government or corporate pinkwashing efforts at future Pride festivals. As a result, several groups are boycotting Pride this year—including Wilmot’s Queer Collective and Dalhousie University’s South House. The festival and Reid have spent the last several months trying to regain community trust through efforts meant to centre the city's diverse voices—efforts like choosing The Magic Project as the parade's grand marshals and helping Halifax Regional Police decide to only march out-of-uniform. Wilmot says those steps have all been positive signs of a more intersectional, inclusive Pride. Reid counters that Trudeau’s presence can help “shine a light” on Halifax’s LGBTQ+ community. But Pride is still a political movement, says Wilmot. It should do a better job of listening to the concerns of Black, Indigenous and Muslim individuals, and acknowledge how much vulnerability those people are giving up when taking part in the parade. This year’s Pride parade begins Saturday at 1pm, and will travel along Barrington Street, Spring Garden Road and South Park Street to finish at the Garrison Grounds. My MCM Dylan Marron brings activism and satire to the fest. Program cut means many willing sponsor groups aren't allowed to help Syrians.